← Re-examine issue of fear using second example of esophageal cancer. Before I discuss how the fear is used to empower hateful ideas, I want to address some issues that are closely related and which will help you understand the next post better. I will discuss meditation a little and then some personal experiences that have led me to a greater understanding about awareness and what is conscious, subconscious and unconscious thoughts. Awareness is our underlying condition; it is the makeup of our being and I would go further than that to say awareness is the fundamental property of the universe, it is what matter is made of. Thoughts are nothing other than awareness and this is seen in meditation. In meditation we don’t control the level of awareness. The thing we control is our level of attention. And we see this in a number of ways. Firstly “we” don’t actually learn to meditate. A meditative state occurs spontaneously if we remain attentive, most commonly by holding fixed focus or concentrating on some anchor. The anchor could be a mantra or an object such as the breath, a flame or the image of a beloved form. In some sense it is an attempt at “not doing” because in being attentive continuously we are trying to not engage with thoughts, not to get hooked by them anymore. With unbroken attention the thoughts do not go away but we don’t “pay them any attention” so they don’t play any part. Strictly speaking the “I” goes away. I or ego-self arises anew with each thought that attracts and arrests attention to become a train of thoughts. It is none other than identifying with the activity of mind. You can think of it this way. The total field of reality is like a huge matrix of probabilities. Engaging with some particular thought that then goes on to become a train of thoughts happens because of an identification that has to do with the “I”. It is choosing some probable aspect and making it real so that all else seems to disappear. The rest of the probable states though don’t go out of existence they are no longer at the focus. When there is no loss of attention, no selecting, then all the possibilities remain in an undetermined state. So thoughts are nothing but awareness of something, of some selection and if that selection seems like a pressing issue or repulsive or attractive then these selections or thought become a train of thought after thought and in a sense “spin the story of our being” at each particular moment in time. It’s fiction. In meditation this no longer happens because the selections are sacrificed in order to remain attentive. Using a constant anchor is not an easy method. It requires sacrifice, to continually ‘not do’ or sacrifice the involvement with thoughts in the mind, and to do that by doing something, ie concentrating on the anchor. A much superior method of meditational practice, especially for the beginner is transcendental meditation. Here the anchor is a sound put forth in the mind. And it is a sound that has some ring to it so that it is not a constant but has a diminishing and hence a settling effect. Certainly as ego-self we still put forth or seed the sound but It is rather like dropping a stone in the waters of the mind. Once the stone is dropped and touches the waters of the mind it leaves a rippling, ever widening wave that is pleasurable. It is not that thoughts vanish, they don’t. It is because the sound engages us in awareness and not as a doer. Furthermore the sound dissipates, and as it does that diminishing becomes our experience and because it is pleasurable we can easily surrender to it.. The experiencer and the object of experience vanish and only the experiencing remains. Thus meditation happens. With meditation you realize that it is not awareness that changes but selectiveness. Either there is awareness or attention centers on some activity with thoughts, whether attractive or unattractive and a struggle. When thoughts dominate, full awareness appears to be lost because the window has narrowed, from infinite to finite and narrow. To try and give some analogy here, suppose that you pick up an object in your hand. You can look at all of it at once or you can focus on some small detail. When you focus on the detail the rest is not so apparent. It is in your field of vision although somewhat blurred but it hasn’t gone away. It is only your attentiveness that has changed. Try another example. If you stood on the edge of a precipice you can view the great expansive valley below or you can focus on some detail, a horse galloping along might attract your attention or some car travelling along a strip of road etc. Awareness of the great expanse is still there but it is not apparent because the detail has captured your attention. Essentially awareness doesn’t change. What changes is our attention. Either there is full awareness or there is engagement with some detail, some thoughts. We do not only actively select what will be conscious, we can also deselect. We gain information through our senses about our physical environment. 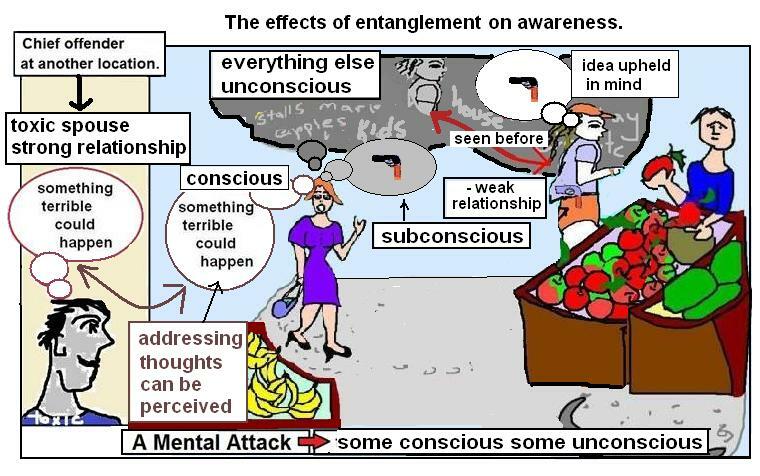 We also gain information directly in the mind through our entanglements with others or relationships. This is our interpersonal environment. And here we might be faced with thoughts that are unpleasant. If they point to real issues and real conditions then we can’t just make them go away any more than we can make go away perceptions of our physical environment. They persist. Their strength however is a function of the degree of our relational entanglements and whether we are directly addressed in the mind or whether ideas relating to us are uphold by others more passively in mind and not directly presented to us. Awareness is a constant. We can’t change it. The comfort zone is rather like putting on heavily tinted glasses. You can still see through them but you lose some of the detail, color for instance. If you change them for a pair that is more lightly tinted then you will see more detail in what you see. In all of this however your eyes haven’t changed; it is the glasses that have changed. If you take the glasses off altogether you will see every detail clearly (given that your vision is good). In the same way we wear tinted glasses in a sense by creating mental fuzz when we use coping habits to live in a comfort zone. It means we don’t change awareness, we only affect our ability to be attentive. So information can be conscious, subconscious or unconscious depending on firstly the actions of others with whom we are entangled/ related take and secondly the selection /de-selection processes which we engage. And the thoughts may not only act as a hook but they may also acts as a filter. 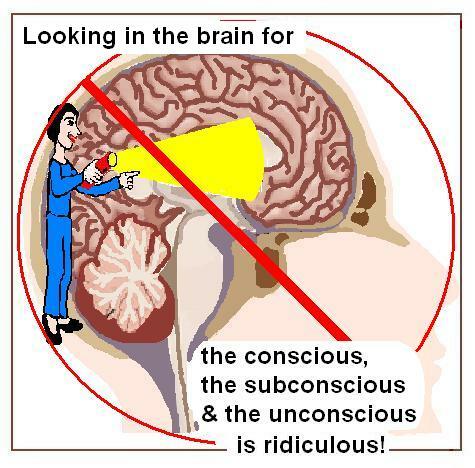 Thus we have created the illusion of there being a conscious, a subconscious and an unconscious. Most scientists adhere to a “materialism is all that there is” and of course ESP is discredited (by the way experiments can be done or not done), so that they consider that consciousness is generated in the brain or by the brain’s activity. This leads psychiatrists, some neuroscientists and others to look for the conscious, subconscious and unconscious somewhere in the brain. It is a ridiculous idea in my opinion. Conscious, subconscious and unconscious are only seeming realities . They occur only because of the level of attention. What difference is there between awareness and consciousness? I think there is a big difference even though I am also guilty of using them interchangeably sometimes. From my experiences where there is identification with the activities of mind “the person” is created and that is associated with limited awareness and the creation of consciousness, sub-consciousness and unconsciousness. In mystical experience or even in the far lesser case of the no-self experience, the personal self disappears and there is full awareness. Everything is made of energy and energy is an oscillation between being and non-being, between selection and the whole array of possibilities, between knowing and not-knowing, so really energy is a function of awareness. We are not attentive of the myriad processes in the body that are part of the body’s basic functioning and at the most fundamental level of the atoms and molecules in our body. But with a lot of very hard work and the use of insight meditation, we can focus our attention on them, make them the subject of concentration and thus bring into consciousness everything from the structures of our internal organs, tissue and cells to the various ways they function to the atomic structures involved. I have reached a cellular and on occasion a sub-cellular level of awareness these and I believe it is possible to go beyond these to the atomic/ subatomic level. And I say “I” because language forces this but in fact it is in a state of primal being. This original aspect of who we are is always aware, always awake. We are spiritual beings experiencing physical existences. The personal self is simulation only, an ephemeral being that arises anew with various thoughts. In the creation of disease it is this personal self that is ‘attacked’ in some sense owing to the ideas that can be presented and which become hooks and lead to subsequent suffering. In the process the personal self is re-created with newer attributes. So for instance when a person struggles against a presented idea that is pure hate, which they erroneously believe depicts some reality, they acquire new attributes and hence a newer persona. This is not “just something in the mind” but has serious implications in the body. A mental attack uses thoughts as weapons but the damage happens in the body and owing to the way a person reacts and not by any magical ability of thoughts. Thoughts are not in business for themselves.. not ever. 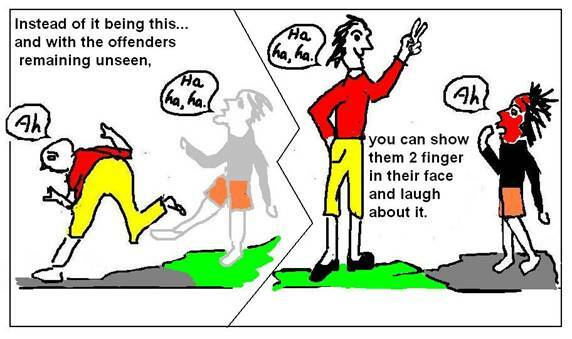 When you realize this you can laugh out loud in the face of your “would-be if they could-be oppressors”. Suffering goes away, BUT not because you “accept it without a struggle” or that it is “something just there” as many New Agers and indeed most Western Buddhists and others are saying. The truth is elsewhere. When there is NO struggle with the hateful thoughts in the mind there is no translation of this struggle in the body, there is no reaction in the body, so in the body-mind there is NO suffering. That can only come about when the thoughts are seen for what they are.. essentially invalid and thus can be discharged from mind. So no suffering is not about “living with cancer” and “rising above it” through positive thinking or some form of meditation, but that the body remains intact and healthy because you realize the whole thing is but a smoke screen and a shadow show. There are many highly developed Buddhists, that can remain with the thoughts without reacting to them significantly but they still die of the disease, be it cancer or heart disease etc. So they have not really dealt with the matter at all they have side stepped it somewhat. I’ve heard attitudes from very highly evolved Western meditators saying things like “how can I avail myself with these unpleasant thoughts”. This is wrong. This is not what it’s about. Fear does heighten perception, including insightful perceptions but it is highly selective and not discriminative. To illustrate this I will tell you about an experience I had in Sydney. One of my sisters and her daughter, my niece and I were walking around the inner city of Sydney one day. We were on a street that is reasonably busy and with a lot of trucks and polluted air. I had suddenly become aware of some danger but looking around I could not see anything and seeing I was in a area that was very familiar to me I told myself whatever it is “it is not a real problem”. Fear may or may not have dissipated, but even if it did, it takes a few minutes for the body to return to rest. Within a minute following my decision I began to smell the vague but quite distinct smell of freshly roasted coffee. I said to my sister “that coffee smells good maybe we could stop and have some”. She looked at me vaguely, as did my niece who was around 11 or 12 years old at the time. What are you talking about? They asked. I told them I could smell coffee. They shrugged their shoulders and we crossed the road, rather diagonally. On the other side the smell of coffee was more obvious but still my sister and niece couldn’t smell it. However a shop further down they began to smell it too and sure enough the next shop following that one there was a coffee shop and they were in the process of roasting coffee. My sister and niece were amazed at my ability and frankly so was I because I did not connect the fear and the heightened perception with the smell of coffee. In looking back, I realize I was able to detect possibly just a few parts per billion in the air, a tiny amount and up against the smelly exhausts of trucks. It was an impressive experience. From the time I first felt the fear and the time that I sensed the coffee were very close, really only a couple of steps. When I felt the fear I must have been still able to smell the coffee but I didn’t know it, because fear made me selective. Only when I dismissed the danger or downgraded it in my mind did I smell the coffee. This showed me that we are capable of acute awareness when we go into a state of full alertness but we filter out things that are not considered a part of danger. In fear concentration is increased and effortlessly but it seems like it is awareness that is increased. In actual fact we only make better use of awareness in states of fear since to some extent the persona becomes vague if not non-existent. And an elected change in priorities (which the circumstances allowed me) my persona returned, i.e., the selection of ideas/ thoughts –“packets of awareness” that make up my ego-self became prominent again. A part of this “package” is coffee, a preference, it is part of me, so “I” detected the smell of coffee in the air. Focusing attention to make more use of more awareness. We can also focus attention to gain information about distant objects and that too needs to be said because here too you can benefit. In my freshman year at university I had been to a number of parties both at the university and privately held that were organized by people who were “the counter culture” and smoking marijuana was highly encouraged and indeed “the done thing to do”. So like many others I too had smoked some dope. I recall one evening at a university dance listening to the band. I was fascinated that I could pay attention to just one instrument and then go on to distinguish the notes made by that instrument individually. I could pick them out of music like you could pick up an individual plate or a glass from the array on the table set out. I could hear those notes one by one specifically and perceive them from the moment a sound arouse to the moment it dissipated completely. I was selecting one sound out of the blaring cacophony of all sorts of sounds from music to talking and dancing to people moving around the hall etc. I fascinated by this game and decided to develop it a little more. I decided to focus on two instruments in particular the lead electric guitar and then the drums. I began with the notes, isolated them and heard them uniquely and then moved my attention to the instruments themselves the strings and the fingers that pluck them and finally the players. I did this also with the drummer. I really thought this was just my imagination because I was at the back of the hall with a lot of people between me and the band. And I had arrived late so I had not seen any of the instruments and the players. I put my “wild imagination” down to the dope I’d smoked. A short time later a class-mate came wandering past and saw me. He stopped and we chatted for a while and then he invited me to join him and his group on the other side of the hall. I agreed and as we cross the dance floor I caught sight of the band players and to my utter amazement I recognized the lead guitar player and the drummer as if I had known them. I had thought my perceptions of them earlier were just imagination but they were very accurate! How was this possible? This was remote viewing! I have since used this ability without any dope but certainly after some practice. It has worked best when I have had a pressing need to know something. The need to know possibly provides more motivation to focus my attention more acutely. I will try to explain it as best I can in a future post because it has help me to remote view on occasions where gaining important information was vital. It shows yet again that awareness is something more than our brain and /or our brain’s activity and a quality of everything in creation. This entry was posted in attention, comfort zone, conscious, consciousness, coping mechanisms and breathing, ESP, fear, fear and ESP, healing, ideas, information, interpersonal environment, mind, nature of ego-self, nature of reality, no self, perception, personal self, physical environment, subconscious, thought stream, thoughts, unconscious and tagged anchor, attention, awareness, Buddhists, cellular, coffee experience, comfort zone, concentration, conscious, consciousness, coping habits, danger, de-select, dope experience, ego self, emotional reactivity, entanglement, ESP, fear, ideas, kyrani99, mantra, matrix of possibilities, meditation, no self, persona, personal self, reality, relational entanglement, relationships, select, sound, struggle with thoughts, sub-cellular, subconscious, suffering, tinted glasses, toxic relationships, transcendental meditation, unconscious, unpleasant thoughts, Western Buddhists. Bookmark the permalink.